Find Remote codes for Philips soundbars. If you have a Philips Sound Bar and want to control it with a Universal remote control, TV remote, Cable remote, or SAT remote, the remote codes below will work when programmed. A Philips soundbar can be controlled with any universal remote control if you have the correct programming guide and the correct remote codes for your soundbar. If the codes below do not work with your Philips sound bar, please leave a comment below with the complete model number of your remote control and model number of your Philips soundbar and we will find you the correct remote code. Program your universal remote control to an Philips Sound Bar. Use the following 4 and 5 digit remote codes. The above codes have shown to work with Philips soundbar models CSS2133B/F7, B5/37 Fidelio, HTL2163B, HTL3110B/F7, HTL2101A/F7, HTL7180/F7, HTL4115B, HTL2101/F7, HTL9100/12, and CSS2123B/F7. Using Xfinity? Use the remote code 32459 or 32311. The above CODE SEARCH (Remote Control Programming) methods are written for Comcast and DIRECTV remotes but can be used and tried with ANY universal remote. The code search methods above are examples of how to get your current remote to control your Philips soundbar. 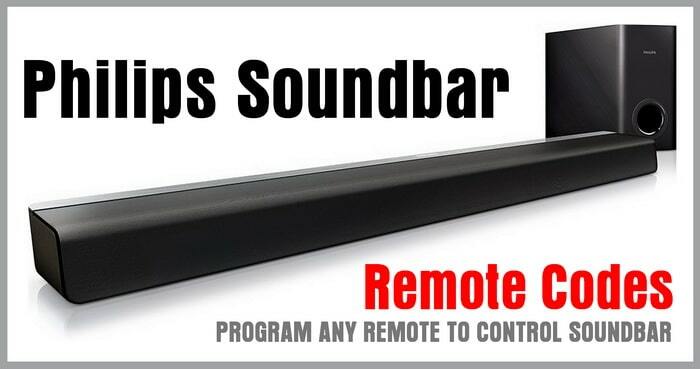 Need more help programming your Universal or CAB SAT remote to your Philips soundbar? Please leave your questions below and we will be happy to assist. What remote control do you recommend for the soundbar Philips soundspeaker HTL2111A / 12? I am trying to program the Philips B5/37 Fidelio Soundbar to my Fios TV/Cable Remote (The Phillips Model P144v2: 4-Device Universal Remote Control). The above codes do not apply. I am trying to program a Philips soundbar HTL1190B with my Sony VLZ620 universal remote. None of the 5 digit codes above worked. I got a Philips Soundbar Speaker HTL3140B and want to connect it to my One For All URC 11-7960 remote? Any tips? I purchased a Phillips sound bar and I trying to program it with a Phillips universal remote ( model SRP5107/27) I can’t find the right code for this remote. I tried all the codes you mentioned and also tried the universal scan. I still can’t program the sound bar. If you could help that would be great. I am trying to program my Philips Fildeio B5 sound bar if the AMP button on my PS3 remote. The PS3 manual says to use three digit codes, and I not your guide says to drop the first zero from the four digit codes, but none of the codes have worked. Has anyone managed to sync the PS3 remote to the B5 Fidelio Soundbar? I have the Philips Fidelio B5 soundbar. Has anyone managed to pair a Sony Playstation 3 remote control (CECH-ZRC10) with it by programing the AMP button. Sony says it is a 3 digit code but they codes you list are all 4 and 5 digit codes. My PS3 remote manual says you can program the amp function with a 3 digit code. Has anyone had any luck pairing the PS3 remote (CECH-ZRC10) with the Philips B5 Fidelio 4.1 Soundbar? I tried 993 and 991 and no luck.